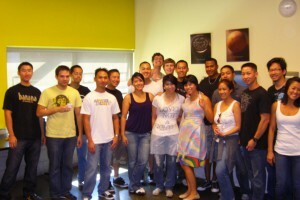 After a busy summer filled with a few fun B4F events around the U.S. to celebrate the official launch of Boobs4Food, B4F celebrated the beginning of the season of harvest with a return to the SF FOOD BANK. This time around we rallied a few new friends to join us in the incredible weather and participated in some intensive arm workouts as we sorted through 4000 lbs. of Granny Smith apples, 2900 lbs. of bright orange Carrots and 8000 lbs. of under ripe Tomatoes. We left no apple, carrot or tomato unchecked as we even executed double duty inspection in order to save everything edible and worthy of donation to the hungry. There would be no wasted produce under our watch! Once packed and stacked, the fruits and vegetables of our labor were en route to support multiple food agencies around SF. Another month, another Saturday, another B4F event, another avenue for all of us to contribute to a bigger cause than ourselves. Thank you to all of our devoted friends who volunteered! 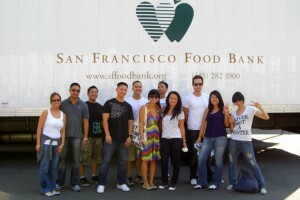 For a quick photo recap of our afternoon at the SF Food Bank, please click here. Special thanks to Elgin of Orson & Citizen Cake for taking time out of his busy kitchen schedule to help fight hunger with Boobs4Food. Stay tuned for info regarding our October Boobs4Food events in Los Angeles & San Francisco, which will be available this week.